Former U.N. Secretary General Boutros Boutros-Ghali died this week, giving ace analyzer Beatrice Rangel a chance to compare just how how far Latin America has come since the fall of the Berlin Wall. The death of former United Nations Secretary General Boutros Boutros-Ghali is thought-provoking as its leads most of the world leadership to reflect upon progress or lack of thereof made by the international community over the last twenty years. 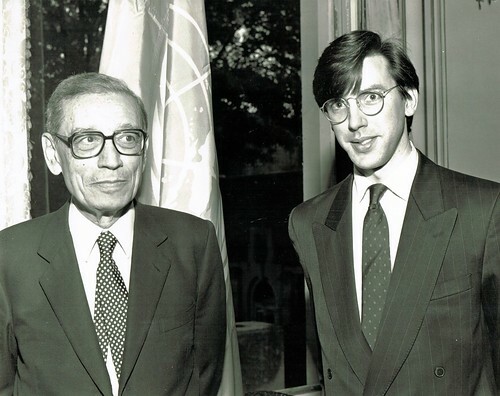 Latin America was spared U.N. attention during Boutros-Ghali’s reign, proving Sir Geoffrey’s description. The sixth UN Secretary General entered the limelight at a moment when the world was fully embracing the promise of multilateralism. With the Berlin Wall gone, the world body effectively dealt with Iraq's invasion of Kuwait and began a successful restructuring of peace-keeping and consensus building. The world was transitioning from a two superpower era to an era of lone leadership by the largest and most effective democracy. The lonely power was ruled by George H.W. Bush, a leader who believed in multilateralism. Mr Boutros-Ghali came with great expectations, as he had been instrumental in the shift of Egyptian foreign policy towards Israel when Anwar El-Sadat made his historic trip to Jerusalem, with Mr. Boutros-Ghali as his Foreign Minister and close adviser. Under Boutros-Ghali's tenure, however, the world began to discover the difficulties represented by the end of totalitarianism in Europe. Countries that had been put together to comply with the bipolar balance of power unraveled in a furious gush of violence, death and destruction. As Europe’s internal situation got more complex with reunification, tribal fractioning, ethnic rivalries and continuing low intensity violence, the world lost the grip over African affairs and soon conflict ruled the day everywhere from the Balkans in Europe, to Iraq, to the ivory continent. Rwanda-Burundi will always be remembered by its death toll of between 500,000 to 1 million -- or 20% of the total population and 70% of the Tutsi population. And these killing fields bloomed under Boutros-Ghali’s tenure, in his own backyard. The Bosnian ethnic cleansing also took place during his mandate. The Americas, on the contrary, were enjoying a rosy rehabilitation. South American countries were recovering from the 1980s debt crisis and being welcomed back into international financial markets through the efforts of U.S. Treasury Secretary Nicolas Brady and U.S. banks writing off the losses. Democracy was finally blossoming around Latin America as bloody dictatorships ended and a historic encounter with the U.S. was taking place. Optimism reigned in the hemisphere as the region vibrated under the spell of the greatest development momentum since the post war period. Mr. Boutros-Ghali also oversaw the execution of the Central American Peace Treaties which brought to a halt the worst conflict shattering the region since the Triple Alliance War involving Paraguay, Brazil, Uruguay and Argentina (1864-1870). By the time Kofi Annan succeeded Secretary General Boutros-Ghali, Latin America had experienced the Tequila Crisis and was about to get hit by the Asian Flu. Democratic resurgence in Haiti and the Zapatista insurgency in Mexico were the greatest political concerns in Latin America, but other than those spots of instability, the rest of the region seemed concentrated on embracing the Washington Consensus and striving to create free trade zones. Both financial crises were overcome by means of setting up support packages involving multilateral and bilateral financial resources. Annan’s tenure, like that of his predecessor, revolved around the Middle East, Asia and Africa. Latin America happily was again a small postscript for the first Secretary General to emerge from the ranks of the UN staff. Under Mr. Annan's initiative, U.N. peacekeeping was strengthened so as to cope with the rising number of conflicts and the need for more personnel. Under his stewardship, the international community created two intergovernmental bodies: the Peacebuilding Commission and the Human Rights Council. The latter was a praise worthy effort to hold member states responsible in preventing genocides, war crimes, ethnic cleansing and crimes against humanity. The Global Compact Initiative he promoted stands as the greatest push yet for corporate social responsibility. Mr. Annan’s game changing efforts were recognized with the Nobel Peace Prize in 2001. Ban Ki Moon was elected in 2007 and will head up the organization until December of this year. The U.N. multilateral financial organizations took center stage at the outset of his mandate upon eruption of the worst financial crisis since the Great Depression. Once financial stability was restored, Mr. Annan worked at strengthening U.N. peace efforts through the New Horizons peacekeeping initiative, the Global Field Support Strategy and the Civilian Capacity Review. These were designed to improve the impact of the 120,000 United Nations "blue helmets." A mediation support unit, along with new capacity to carry out the Secretary-General’s good offices, have been set up to help prevent, manage and resolve tensions, conflicts and crises. Violations of human rights have been thoroughly investigated through inquiries related to Gaza, Guinea, Pakistan and Sri Lanka, legal processes in Lebanon and Cambodia, and advocacy for the "responsibility to protect," the new United Nations norm aimed at preventing and halting genocide and other grave crimes. Ban Ki Moon has also promoted the strengthening of the UN response capacity vis-à-vis humanitarian crises such as those abating Myanmar (2008), Haiti (2010) and Pakistan (2010). Again Latin America has commanded little or no attention from the current U.N. Secretary General. His concertation on fighting terrorism and bringing peace to the Middle East obscured his vision of Latin America. Populism undermining democracy and freedom caught the U.N. looking in another direction. Today, that populist itch seems to be fading - witness the recent elections in Argentina and Venezuela and even this weekend's referendum denying Bolivia President Evo Morales extra terms -- but damage perpetrated to some nations might have horrific consequences for the future of the Western hemisphere. The Howes dictum would indicate that progress and stability will be at stake in the Americas over the next decade. And as the world prepares for the election of a new U.N. leader, the question arises as to whether Latin America will be able to contribute to world progress or whether it will enter the world priority list of regions to be taken to the U.N. ICU - intensive care unit. The answer to that question will largely depend on whether the institutional framework of its nation-states can survive the demise of populism. So far, Argentina seems to be coping extremely well and succeeding in its renewed quest to deepen democracy. but the two great unknowns, of course, are Cuba and Venezuela. Havana seems to continue to suppress change in favor of preserving Fidel Castro’s image of world leadership. And as the Cuban nomenclature plays dice with history, the Venezuelan economy melts down drowning any possibilities of stabilization for both countries. Should a humanitarian crisis erupt in Venezuela, Cuba will follow suit and then perhaps the Americas will back on the priority list for the U.N. Secretary General. That would signal the end of the “decently stable and prosperous” age.